When this was released a lot of people thought it was a secret alter-ego of Swordfish. They were wrong - it was actually the work of an innovative duo from Brighton. I'd been given a demo of their incredible track "Elevator" by the manager John Burfitt. It was so good I had to release it and so we did. The limited edition coloured vinyl 12" sold out quickly and has since become a collector's item. The album features part of the "Elevator" epic alongside other good tracks including the "Shape Of Life" - mix by Spiralhead. 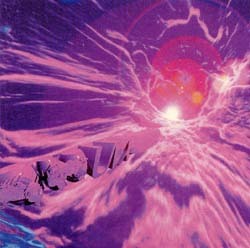 UVX were ahead of their time and this album still sounds like an innovative aural adventure.